On 12 October 2017, EDP Sciences signed a partnership agreement with the Technische Informationsbibliothek (TIB) – German National Library of Science and Technology to support the publication of conference proceedings in a number of STM fields. The agreement will enable the TIB to publish all German conference proceedings in the areas of Physics, Engineering & Technology, Chemistry, Mathematics and Computer Sciences in the Web of Conferences journal series at a special discounted rate. EDP Sciences launches EPJ.org mobile app. Available and free to download from the iTunes App Store and from Google Play (for Android devices). Keep up with the latest research in the physical sciences with the EPJ Journals app. 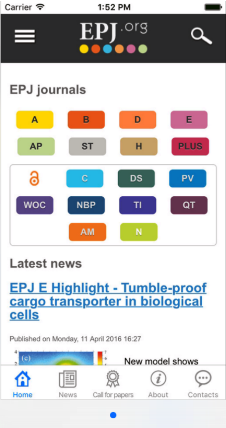 The app offers a news sections with lay summaries highlighting the findings reported in selected research papers, updates on the journals contents as soon as they are published, including research papers, reviews, colloquia and proceedings papers from all European Physical Journals (http://www.epj.org). You can search to find specific papers, navigate the journals contents by issue and find out about active calls for papers. EPJ is a series of peer-reviewed journals dedicated to high quality science, edited by distinguished researchers from across the world, published by EDP Sciences, the Società Italiana di Fisica and Springer. Note: if you are accessing through a mobile device connected through your institutional VPN, you will be able to access the full text PDFs if your institution has a subscription to the journals. Some of the EPJ journals are published in Open Access so they are fully accessible to anyone, from anywhere. EDP Sciences is pleased to announce that it has signed an agreement with Portico to provide a permanent archive of the e-content for many of their key journals. Through this agreement, institutions participating in Portico’s E-Journal Preservation Service will be assured continued access to EDP Sciences content for generations of their scholars in the future. Current data will be sent to Portico as soon as the e-journal is published, and a full list of the journals committed to the Portico archive is available at http://www.portico.org/digital-preservation/who-participates-in-portico/participating-publishers/edp. For more information read Press Release (PDF). Web of Conferences has great pleasure to welcome to its platform the Proceedings from CEA conferences. This new website gathers the proceedings of conferences organized by CEA researchers and published by EDP Sciences via Web of Conferences. CEA, the French Alternative Energies and Atomic Energy Commission, is a prominent player in the European Research Area, it is involved in setting up collaborative projects with many partners around the world. Web of Conferences is pleased to present its new website. More modern, more ergonomic and more complete, this new platform has been designed for an easy and fast access to all contents. You will find your usual tools, enriched and improved in terms of technology and navigation: announcements of upcoming scientific events, free access to conference proceedings, news, list of collections, link to open access journals… You will also discover new contents designed for easier access to all relevant information to different audiences. Web of Conferences is a major player in the publishing of scientific conference proceedings. This new interface is designed to make our offer clearer, and to highlight the quality of our services and the high-level of expertise. The European publishing partnership for physics, The European Physical Journal (EPJ), celebrates its 15th year in 2013. During this time, EPJ has launched new open access titles, either in response to the emergence of new research fields at the interface between more established subjects, or to fill obvious gaps in the EPJ catalogue. After the early launches of EPJ Web of Conferences (the open access proceedings repository) in 2009 and EPJ Photovoltaics in 2010, 2012 witnessed the launch of EPJ Data Science. This year, three new journals are about to join them: EPJ Nonlinear Biomedical Physics, EPJ Techniques and Instrumentation and EPJ Quantum Technology. EPJ is also pleased to see EPJ C – Particles and Fields lined up for conversion into a fully open access journal under SCOAP3 (Sponsoring Consortium for Open Access Publishing in Particle Physics). In addition to these journals and in keeping with its commitment to raising the profile and impact of research in new emerging fields, EPJ has accurately identified and addressed other specific needs in the scientific community. The first example is EPJ Special Topics, launched in 2007 as the successor to Journal de Physique IV. The journal publishes only complete special issues and has rapidly reached an impact factor of 1.56. It is designed to address highly interdisciplinary topics, technical summary reports from research networks, and selected review-style theses of outstanding quality. A further example of a successful renewal is EPJ Plus, which serves as EPJ's general physics journal and moreover seeks to provide further insights into previously published work through the detailed documentation, verification and critical assessment of data and results. The overall strategy of EPJ is to use its solid basis in the physics publishing landscape, i.e., its established sections EPJ A-E, to further develop the EPJ brand as a framework for the participating partners to launch new (open access) journals. For more information please read this text written by the EPJ Steering Committee that has just been published in Europhysics News. 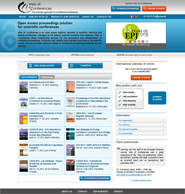 EDP Sciences, a historical partner of the scientific communities, is rolling out EDP Open, its new Open Access portal. The site is accessible at www.edp-open.org. EPJ Web of Conferences is now indexed in Scopus, the world’s largest abstract and citation database of research literature. Scopus covers more than 20,500 titles from over 5,000 international publishers, in the scientific, technical, medical, and social sciences. EPJ Web of Conferences now provides online references, which are directly linked to the cited articles, via Crossref. This allows the readers to move from one article to another at the citation level, regardless of journal or publisher. EPJ Web of Conferences also provides a citation tracking system.